Reliance JioPhone is now up for beta testing for Reliance employees and some other people. The feature phone will be up for pre-booking from August 24, and the first sale will take place in the first week of September. Before the pre-booking itself, India’ second largest telecom player, Vodafone wrote a letter to telecom commission claiming that the ‘effective free phone’ will further dent the revenues of telecom operators. 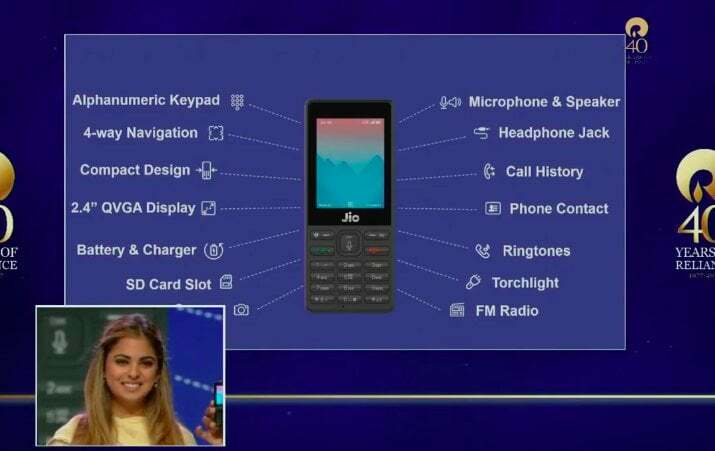 For the unaware, Reliance Jio Infocomm’s Chairman, Mukesh Ambani, last month announced the JioPhone at the company’s AGM meeting. Effectively priced at Rs. 0, RJIL would collect a fully refundable amount of Rs. 1,500 per unit. Vodafone also claimed that it has reported a constant decline in its revenues from telecom services, and has even recorded decline of 3.42% in the quarter ended June 2017. The operator also called for reducing the interest rate applied for deferred spectrum payments. “…a reduction in the interest rate applied for deferred spectrum payments is necessary to reduce the burden on operators. Hence, we have requested a reduction from 10 per cent to G Sec rate of 6.25 per cent – 6.5 per cent on deferred payment,” said Vodafone. Vodafone also highlighted that the revenue share with the government imposes an enormous burden on telecom operators even though companies purchase spectrum at market price. Vodafone also “requested DoT to consider the recommendation of the Telecom Regulatory Authority of India (TRAI) for reducing Universal Service Obligation Fund from 5% to 3% as private operators have already rolled out services in rural areas and current call termination rates are very low,” says a PTI report. “…despite having rolled out in rural areas, we still have to pay USO, and the mobile termination rates are also below cost which adversely impacts us since the majority of the calls in the rural areas are incoming,” the letter said. For now, a telecom operator charges 14 paise for every incoming call that it receives from other operators. “Therefore, we earnestly request kind consideration and early decision on reduction in the USO levy from 5 per cent to 3 per cent and reduction of interest charges along with rescheduling the payment period, which has been tabled before DoT and IMG (inter-ministerial group),” Vodafone said in the letter. The Reliance JioPhone is expected to create yet another disruption in the Indian telecom market. Already, telcos are reeling with enormous debt and the revenues are down as well. After the entrance of Jio to the Indian market, Vodafone and Idea Cellular announced their merger, followed by Airtel-Telenor acquisition, and RCom-Aircel merger. The jio phone which is likely to be launched is of Chinese make than should be banned in the national interest else RJIL should reveal the place of MFR. Mine was over by today mrng. So had u recharged before or u did it today,mine was yesterday showing validity as 16aug yesterday and now today its showing 17 aug. Still I’m yet to recharge my no. So is ur high speed data and calling working,mine is getting extended every day for one more day. Then, as you know, it’s better not to recharge till the free benefits are over. What a company? No proper system for anything.